Show it off in high style. The multi-faceted aluminum framing and hexagon-shaped corners link to form a distinctive contemporary design. 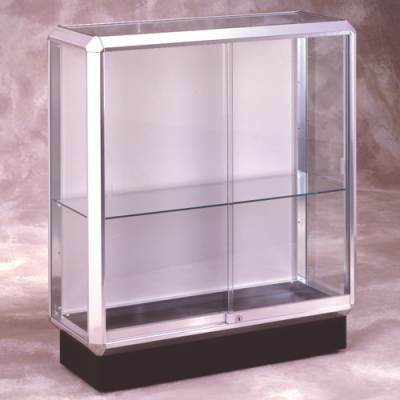 Durable as well as attractive, features include tempered glass, built-in locks, and steel shelving hardware. Includes 1 full length adjustable frame and plaque fabric display back. 36"L x 40"H x 14"D including 4"H base. Available with Chrome and Dark Bronze frame colors.